Health and Beauty Notes: Wine, is it good or bad for health? Wine, is it good or bad for health? Last night I went to a wine and cheese get-together organized by the Lions Club. Since I was watching my blood sugar, I did not take any wine, except for a few sips to choose the best tasting wine out of three. I did not take any wine because I thought wine was going to increase my blood glucose level. Today I learned that it does not, when taken in moderation. I learned that alcohol cannot be changed into glucose or blood sugar, and does not need insulin for metabolism. That is good news indeed, not that I drink a lot of wine, but when the occasion calls for it, I don't have to worry if I were to take a small glass of wine. Recently, I read a study by Kaiser Permanente that indicated that breast cancer risk from drinking three or more alcoholic drinks a day is similar to the increased breast cancer risk from smoking a packet of cigarettes or more a day. The study also says that red wine, white wine, beer and hard liquor present the same risk. I have read so many reports and studies about how red wine is good for the heart. This study by Kaiser Permanente seems to contradict the benefits of drinking red wine. So should I or should I not drink any red wine? I am not yet a diabetic but numerous studies in the last several years indicate that people who drink small amounts of wine are the people least likely to suffer diabetic complications. In a study published in 1990 it was said that, “Alcohol is known to induce low blood sugar.” This reducing of the blood sugar reduces the damage to blood vessels and thus has a beneficial effect. That means it is safe to drink wine especially for me who has a family history of diabetes. A Danish study in 2000 called Copenhagen City Heart Study, has indicated that the use of moderate amounts of alcohol may prevent the onset of diabetes and so individuals who are drinking in moderation may not develop diabetes even if they have the genetic predisposition. I do not have a family history of breast cancer, and weighing these two risks, I think it should be safe for me. According to a University of Wisconsin study (JAMA Jul 99 Vol 282 No 3) , moderate consumption of alcohol a day reduces the risk of coronary heart disease in people with Type 2 diabetes by 80%. Ok, that does it. I will not refrain from drinking red wine! I don't care what the report write now,they keep changing.I love Merlot and Pinot..b4 I have baby I drink 3-4 glass a day,but now just once a while...I open one bottle for a glass,to get the next glass hubby sudah hentam habis the whole bottle. Beachlover, I think drinking in moderation is the key. Keep in under 3 glasses a day. Also I think we think to think what, as far as our health goes, we are genetically predisposed too. Since I don't have a family history of breast cancer but have family history of diabetes, I should say it drinking wine is safe for me. 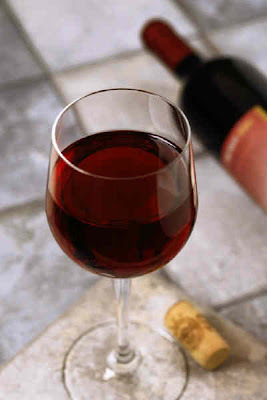 Red wine is the one that is supposed to be good for the heart. The others don't quite have the same benefits.